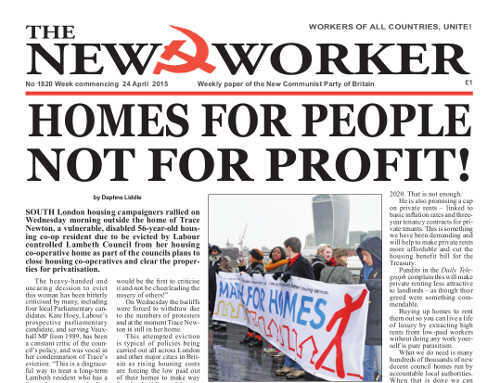 www.newworker.org | 24th April 2015 -Homes for people not for profit! SOUTH London housing campaigners rallied on Wednesday morning outside the home of Trace Newton, a vulnerable, disabled 56-year-old housing co-op resident due to be evicted by Labour controlled Lambeth Council from her housing co-operative home as part of the councils plans to close housing co-operatives and clear the properties for privatisation. The heavy-handed and uncaring decision to evict this woman has been bitterly criticised by many, including four local Parliamentary candidates. Kate Hoey, Labour’s prospective parliamentary candidate, and serving Vauxhall MP from 1989, has been a constant critic of the council’s policy, and was vocal in her condemnation of Trace’s eviction: “This is a disgraceful way to treat a long-term Lambeth resident who has a home that is among the best examples of a tenant-improved property. I will be standing with Trace and her supporters to stop the bailiffs from carrying out Lambeth’s attempt to wipe housing coop residents off the map — a policy they said they were against! On Wednesday the bailiffs were forced to withdraw due to the numbers of protesters and at the moment Trace Newton is still in her home. This attempted eviction is typical of policies being carried out all across London and other major cities in Britain as rising housing costs are forcing the low paid out of their homes to make way for the building of luxury flats in landscaped estates that are attracting buyers from all over the world as investments which will continue to rise in price — and to be rented on short term leases and sky high rents. Few of these residences are bought by people who want to live in them. FAST Food workers in Britain last week joined a one day international protest for higher pay, just days after mainstream politicians promised modest rises in the legal minimum wage. Demonstrations in London began at McDonalds in Marble Arch on Wednesday 15th April morning, where activists went on to occupy the restaurant. Thirty protests are took place across the country according to campaign group Youth Fight for Jobs, and are inspired by the Fight for $15, a movement for higher wages in the US. Workers are demanding a £10-per-hour “living wage” and an end to zero-hours contracts, which do not guarantee employees a minimum number of hours. WHEN a passenger ship goes under it naturally provokes an outcry amongst the seafaring community and the public at large. When the Titanic sank in 1912 with great loss of life, the subsequent inquiry, along with those of a similar United States Senate investigation, led to important changes in safety practices at sea. More recent inquiries have led to measures to ensure that crews follow safe working practices and that all equipment on board is properly installed and maintained and that everything is done to guarantee the health and safety of all the passengers on board. But it’s a different matter when a ship packed with migrants trying to enter Europe via Libya sinks. Last weekend a cargo ship went to the aid of a merchant vessel with engine problems in international waters south of Sicily. Many of the approximately 900 people crammed on board ran to the side of the vessel to be rescued and it turned over. Over 800 migrants are believed to have drowned when the packed boat capsized. Others were trapped inside behind locked doors when the ship sank and only a handful have survived. French President Francois Hollande rightly said that this could be “the worst disaster in recent years in the Mediterranean” and Maltese premier Joseph Muscat has slammed the human traffickers who risk people’s lives by putting them on rickety ships in unpredictable waters. But other reactionary politicians and their lackeys in the gutter press are simply using the issue to whip up more anti-immigrant hysteria to justify austerity and creeping fascism in Europe.